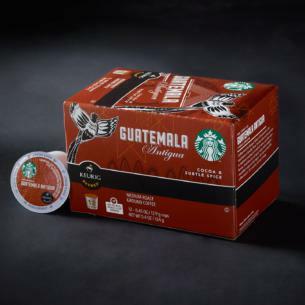 The Antigua Valley of Guatemala is treasured for its 100-year-old farms, nutrient-rich volcanic soil and its coffee, which is the touchstone of quality. Farmers take enormous pride in traditions they’ve passed on for generations. As a result, the coffee you experience is rich and multidimensional, with a flavor that’s consistent, cup after cup—lemon, chocolate and soft spice notes with an elegant mouthfeel unique to this region. It’s why we loved this coffee back in ’71, and why we love it today. Is your coffee in the grocery stores the same as the coffee in your stores? Absolutely—only the packaging is different. This is so you can easily find your Starbucks favorites in the coffee aisle. A caramel-dipped apple beneath a flowering bougainvillea. You might also like our well-balanced and nutty Colombia, another gem from Latin America.